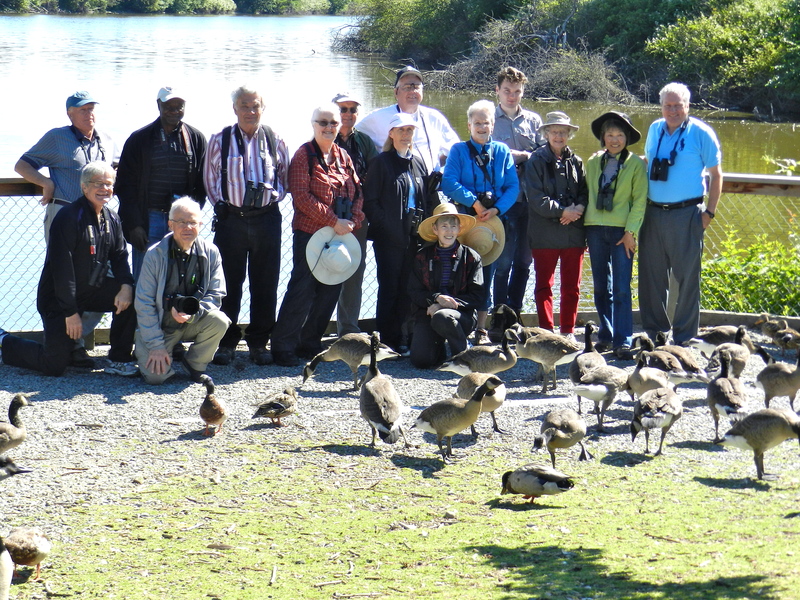 Another awesome Wednesday of Delta Nats Casual Birding at the Tsawwassen Ferry Terminal and then on to our Mecca, Reifel Bird Sanctuary on Westham Island. Fifteen participants (Ken & Anne, Jonathan & Lorraine, Marion S, Hans-Ulf & Gerhard, Roger M, Mike B, Eleanor C, Kay G, Eric L, Jane Z, Alan P and me) saw some beaut birds; hi-lites included, Whimbrels and a Marbled Godwit, Black Oystercatcher family, Harlequin Ducks, Willow Flycatcher, three Teals (Cinnamon, Green- and Blue-winged), both Greater and Lesser Yellowlegs, and our first-of-the-season fresh Strawberry Sundae at Emma Lea’s Farm. 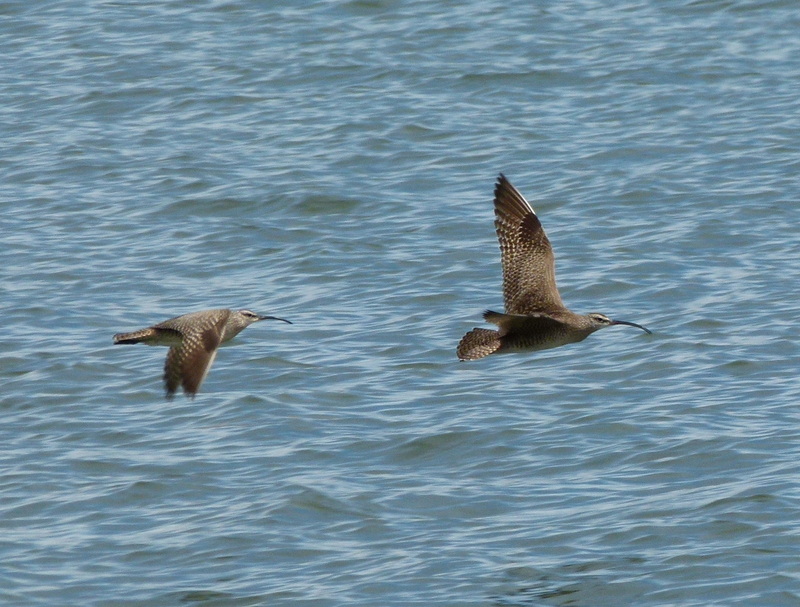 Check out Eric’s, Ken’s and other’s photos on our Picasa site at http://picasaweb.google.com/dncbirding. Our first stop after leaving Petra’s at 7:30 a.m. was the pull-off along the causeway just before the pay booths at the Tsawwassen Ferry Terminal. There were many (100+) Great Blue Herons, both mature and young, foraging in the low tide mud in the Bay. The Tsa Tsu Shores Heronry seems to have again been very successful. Five Black Oystercatchers were along the shore and, when we crossed the highway to the east side, we were entertained by a family of four in the grass and stone beach. This is one of the spots around the Ferry Terminal where Black Oystercatchers regularly nest. We walked the path beside the road searching for the Whimbrels, our target bird, and we were rewarded when the flock of 11 birds plus one Marbled Godwit landed in front of us (see photos). White-crowned Sparrows also posed for us on logs as squawking Caspian Terns flew over us. Following a “Ladies Stop” at the Ferry Port, we parked at our usual spot beside the “No Parking” sign to photograph two gorgeous male Harlequin Ducks resting on the rocks. Lots of Double-crested Cormorants on the breakwall (and a Harbour Seal), but no Black Turnstones seen today. We drove through the Tsawwassen First Nation land and the Ladner farms toward our regular stop at the Fraser River outlet near the Westham Island Bridge. Saw several “regulars” along the way including Savannah Sparrows, Cedar Waxwings, House and American Goldfinches, Spotted Towhees, Eurasian Collared Doves. 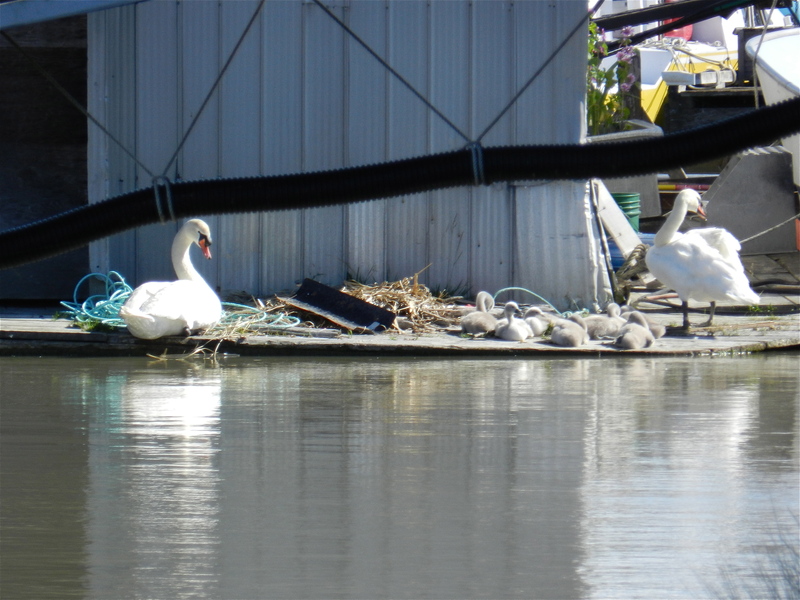 At the Fraser River parking lot, we saw the Mute Swans with seven fuzzy Cygnets at their nest on the float home. The fisherman owner, thinking we were spies, came out to ease his concerns and gave us the Mute Swan saga, noting that they had nested on his dock for the past eight years, usually having 6 or 7 cygnets. We got to Reifel at about 10:00 a.m. and met Marion who had been patiently pining for us for an hour (we were uncharacteristically a bit late). I shared a few stale peanuts with the three “regular” Sandhill Cranes (probably from their nesting area beside Richmond’s Country Meadows Golf Course on Number 6 Road) hanging around the parking lot. Barn Swallows were guarding their mud nests under the eaves and lots of Tree Swallows around some of their nesting boxes. But (too) many boxes were used by House Sparrows. Interestingly, parasitic Brown-headed Cowbirds were everywhere, probably raised by the House Sparrows. Following the mandatory Group Photo above the “Carp Pond”, we wandered along the east trail toward where Varri had said the Great-horned Owl was roosting. Lots of mottled dabbling ducks (mostly Mallards) around, including several Wood Ducks. We heard the Willow Flycatcher and got good looks at it from the “wrong side” of the path. A nice male Black-headed Grosbeak landed on the path for a quick look. A photographer had apparently scared away the GHO. We heard it hoot twice, but could not find it in the trees. 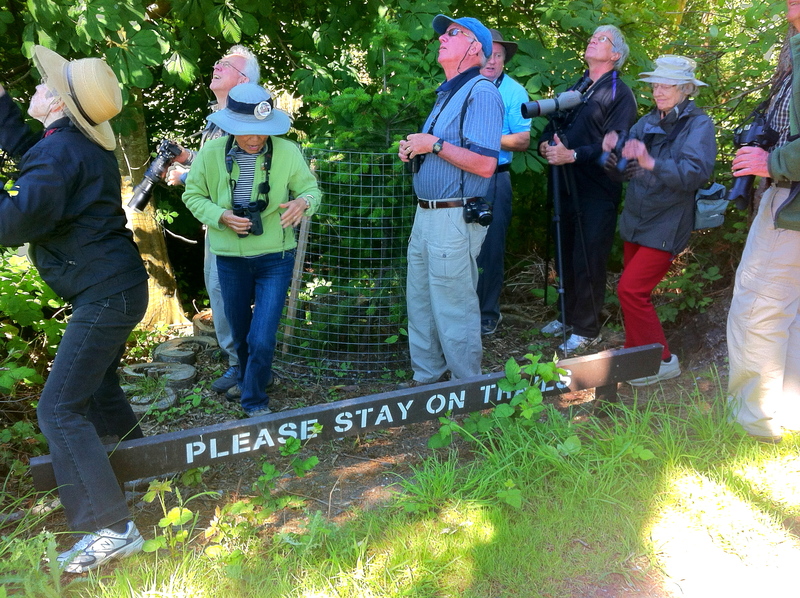 Some saw a Yellow Warbler. Along the path, we met Reifel Manager Kathleen who was happily shepherding her latest treasure, a baby black Squirrel. Nice photo-op. A family of Red-breasted Nuthatches was “yenking” above us and we even saw a parent feeding a youngster. At the tower there were several waterfowl species feeding in the ponds below, including several Yellowlegs (two were together for easily distinguishing Greater and Lesser), Northern Pintail, Northern Shovelers, Gadwall, and, for the second week in row, we saw all three Teal Species (lots of Green-winged, two Blue-winged and one Cinnamon). Gerhard finally saw, and Hans finally photographed one of the seemingly hundreds of Marsh Wrens noisily singing all over the sanctuary. Along the outer path, I fed a few more stale peanuts to the two “resident” (note difference from three “regulars” above) Sandhill Cranes (they lost this year’s Colt a few weeks ago). It was near Noon so we wandered back to the entrance where, in the parking lot, Jane again treated us with her Tupperware dish of Red Current mixture. Not being completely satisfied, we stopped at Emma Lea’s Farm for a fresh Strawberry Sundae and relaxed in the sun watching and reminiscing of my first job in Niagara Falls as the kiddies picked the berries in the fields. On the way home, Eric spotted a Killdeer pair sitting on a nest in the driveway of the farm at the corner of 33A Avenue and 41B Street. Similar to last week’s Iona Killdeer, I wonder whether this precarious nest will survive. Another grand DNCB morning. About 40 Delta Nats enjoyed a fabulous end-of-year Garden Party at Pamela and Jennifer’s beautiful home and garden in Tsawwassen last Friday. The rain did not dampen the evening, and we learned that lots of Nats are excellent chefs as the hors d’oeuvres, salads, main dishes and desserts were very tasty. 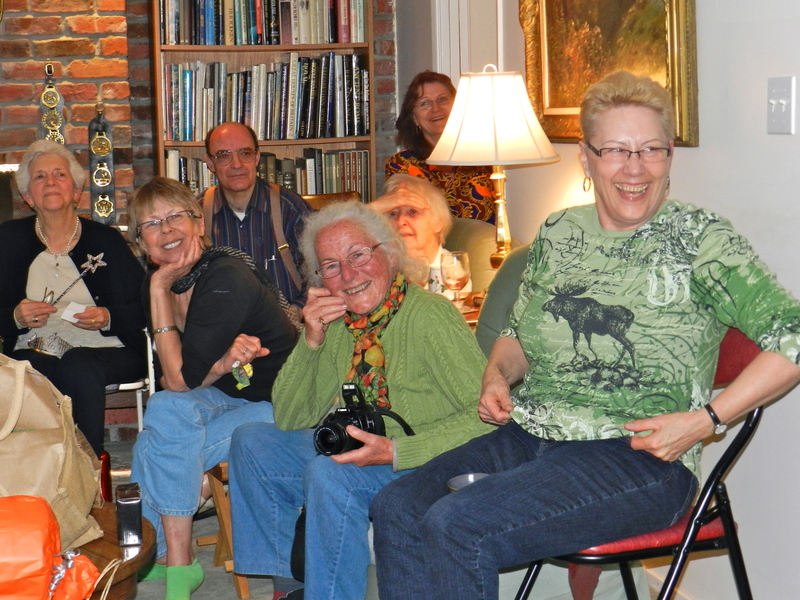 Thanks to Pam/Jen for hosting us for the umpteenth year and our Social Team of Lorraine, Marilyn, Mary and Eleanor for organizing the goodies. Perhaps we’ll get some of Ken or Ursula’s photos soon on our Picasa site or on our DNCB Blog at www.dncb.wordpress.com. Next Wednesday, July 4, DNCB’s will leave Petra’s at 7:30 a.m. on an outing to Campbell Valley Park. It may be a longer outing (i.e. return to Tsawwassen around 2:00 p.m.) so participants might want to bring a snack, for themselves and the leader. As usual, comments welcome, and tell me if you want off the List to receive this nonsensical literary diarrhea. This entry was posted in *DNCB, Reifel, Tsawwassen Ferry Port, Westham Island. Bookmark the permalink.